In the world of social media, there’s this unspoken rule that we should never EVER "like" our own posts. Doing so would result in a significant decrease in our cool factor online. Liking our own posts just makes us seem like we're "trying too hard." It's one form of social suicide, right? Right? 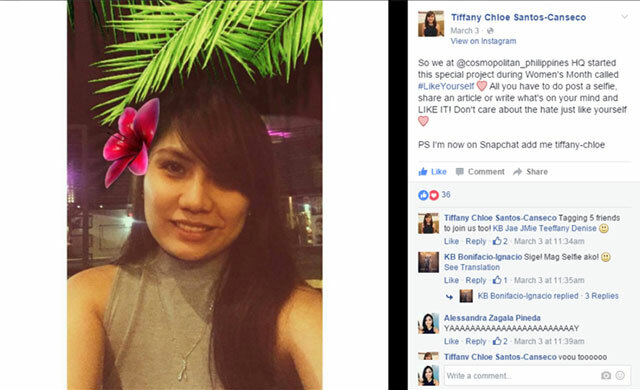 We at Cosmopolitan Philippines are trying to debunk that so-called rule because there is absolutely nothing wrong in liking and loving who we are and what we post. 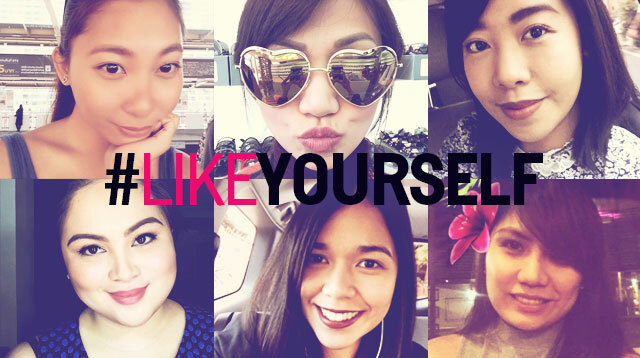 In celebration of International Women’s Month, we’ve started The #LikeYourself Project—which is our chance to give ourselves that double tap without any shame! 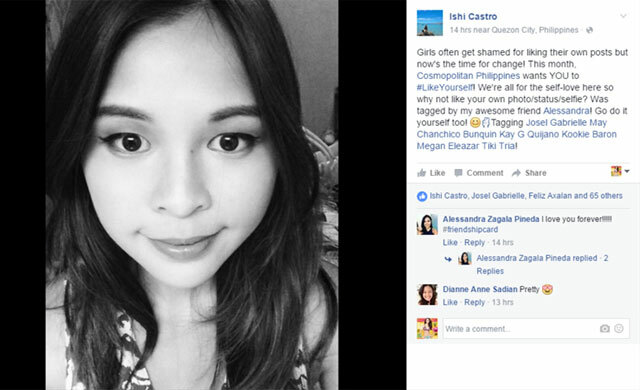 Here, we gathered the most inspiring #LikeYourself entries so far and we’re hoping these women will motivate you to join in on our campaign! "A strong woman is both kind & fierce. A strong woman is both powerful & respectful. A strong woman knows how to laugh, as much as she cries." "It's Women's Month and what makes it more special for me is the feeling of completeness now that I am a mother to Maria Letizia. Being a mother is really the greatest joy and privilege. Nang dahil sa pagiging ina, mas marami pa akong natutunan sa pagiging babae." "Do you #LikeYourself? That's the first step to living your best life." "Posting this to remind myself that I'm made of perpetually mismatched eyebrows, keloids, thunder thighs, small ears, and lots of dark brown skin to show off to the world." "You are more than what you think you are!" "Remembering my #Vday2016 look (plus the memories it came with) and double tapping my own photo, because I'm cheesy like that." "Choose you. Do you. And the rest will follow! Like and love yourself. Be selfish sometimes! Love your curves, embrace your edges. You are worth it." "So what if you're totally obsessed with your selfie (may kilay man o wala, mukhang sto niño man o hindi) or your opinion (at least you give a damn about something relevant like the elections!)? Let's show the people who love to hate us that we don't care about their ka-negahan! Kung bet mo, i-like mo!" "Even if others see me differently, even if others aren't happy with it, even if the negativity would come from people close to my heart. What's important is I like who I am and the choices I've made up to now." "I'm 38 and I feel great. My imperfections and flaws make me beautiful and unique. I feel young and vibrant and I like that about myself." "I firmly believe that you should love yourself first and the rest of the world will follow. I suggest you do this too! It's liberating!" "My make-up for today...why not?" "I uploaded a video of sample makeup that I'll be doing for a friend's wedding, which I sent to the bridesmaids for approval. Just because I think I did a pretty good job at it. (And I don't look too bad in it either)." 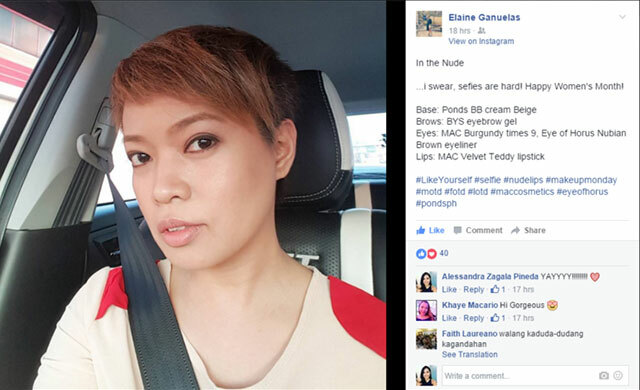 "Too often, I overanalyze posts I make on social media (selfies, especially!) because of what people might think. But I'm slowly learning that I don't always have to rely on others' validation." "You gotta be your own believer, girl! Spread the love not the hate." "We get shamed for liking our own posts but whuts wrong with that, huh? Paano kung like na like mo lang diba??" I swear, selfies are hard. Happy Women's Month! Don't care about the hate, just like yourself! Girls often get shamed for liking their own posts, but now is the time for change. We're all for self-love here, so why not like your own photo/status/selfie?